An action film that passes muster. Once watchable with no great expectations. Good visuals, glossy action, voguish (although Bollywoodish) songs are the pluses. Story-wise, it falls flat. Jil has its own moments of entertainment with negligible negatives, which are easily overtaken by the performances and taking of the film. Gopichand, Raashi Khanna's on-screen chemistry is top notch, closely anchored by villain Kabir Singh. Commercially ‘Jil’ might open brightly in this summer vacation. It should either sustain or accelerate with positive mouth talk. 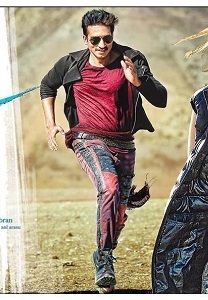 How far ‘Jil’ can break top records of Gopichand ‘Loukyam’ and how the lower class audience connect with this film has to be wait and seen. Second half is completely dedicated for the cat and mouse between hero and villain. All other elements take back seat, but there is some comedy in the form of Posani's character. Although Jil breezes off with racy screenplay we get the feeling of dejavu in many scenes as this formula is not new to us. The much awaited action film 'Jil' has finally hit the screen today. This film proves to be the one with more style and less substance. The locations of Spain and the new character of Fireman as protagonist played a good role in pulling the attention of audience. Director Radha Krishna proves that he is a man with mettle and can deliver better products provided the story is more impressive. He came with routine story with no twists and turns to arise the interest of the viewers. First half is fine with little bit of romance and second half takes serious turn. Director clearly forgot that viewers will love humor and he excluded it and whatever he included failed to tickle viewers. Rain fight in the second part has manged to win some cheers in the theaters. The new bee on the block, Radha Krishna Kumar, the director of the film was decent enough in dealing the film. The movie Jil will definitely remain as one of the finest outputs by Hero Gopichand. Jil is filled with lot of fire from Gopichand that makes the hearts of audience chill. While the first half is a breeze, the second half is a bit tacky as some scenes haven’t been well-conceived and well executed. You also feel that the director should have tightened the script a bit during the second half. On the whole, Jil is one of the most stylized films that has come out in the recent past. Stunning visuals, peppy music and decent performances are basic assets. If you end up bearing the routine story and a predictable second half, you can definitely watch the masala entertainer this weekend. Radha Krishna Kumar came with a routine entertainer on debut. Tollywood viewers have seen many such films and first half turns out to be average with romantic scenes between Gopichand and Rashi Khanna. Second half turns out to be serious. Radhakrishna Kumar's direction, screen-play is routine and did not inspire any interest. There is nothing much to talk about the film as Radhakrishna's inexperience showed in his screen-play and direction. Many are left to wonder how Gopichand who scored a hit with hilarious entertainer like ‘Loukyam’ returned back to mass entertainer like ‘Jil’. Hero Gopichand forms the backbone of the film. He looks extremely stylish in the new avatar. He has a powerful role which he plays with a lot of ease as usual. Rashi Khanna is quite a revelation in the film and she was shown absolutely hot and raunchy. She looks gorgeous and oozes glamour to emerge as a biggest crowd pulling factor for the film. The baddie Kabir Singh (role of Chota Nayak) is terrific in his looks and is very promising, as he suits the character very well. First half of the film is nice. Second half is little slow. Plus points of the film are good technical standards, great production values, songs and stylized content. On the flip side, the content in second half is not effective and it’s violent at times. We have to wait and see how Jil (coming from Gopichand whose previous film Loukyam a big hit and UV Creations whose two films Mirchi and Run Raja Raun were big hits) fares at box office. Finally Jil is planned to be a stylish commercial entertainer. The style part is top notch but the story drags on predictable lines with second half totally going haywire with slow paced narration with complete absence of the right kind of emotions, romance, thrills and comedy to make it gripping. Not a film that can not be missed!